Last year's prime cattle champion - a Limousin cross heifer from Harry Brown, Auchmaliddie Mains, Maud, which sold for £4,600. Almost 500 entries are forward for the annual Christmas Classic show and sale next week. The two-day event, organised by Aberdeen & Northern Marts (ANM) in conjunction with the Aberdeen Fatstock Association and sponsored by NorthLink Ferries, takes place next Monday and Tuesday. Various shows and sales of prime and pedigree livestock from across Scotland will take place as well as the Rising Stars Exhibition calf show, which has attracted 24 entries for judging by Stuart Hunter of West Cairnhill, Culsalmond. 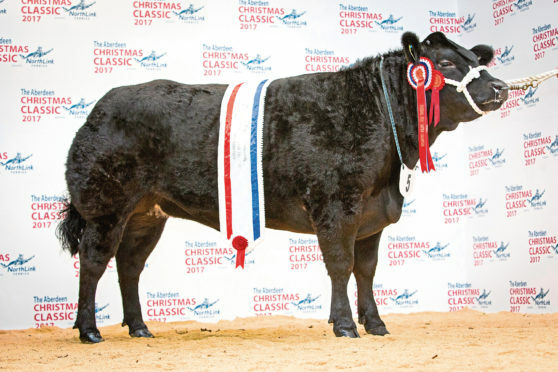 “We are pleased to offer a high standard of prime cattle and sheep entries at this year’s Christmas Classic,” said ANM prime and cull livestock manager Tim McDonald. The prime cattle contest has attracted 60 entries, with Hugh Black of Hugh Black & Sons, Lanark, and Murray Lauchlan of David Comrie & Son, Comrie, tasked with judging the haltered section. The unhaltered cattle judge is John McIntosh of Goval, Dyce. Judging of the 150 prime lambs forward will be carried out by Louise Forsyth of WTS Forsyth & Sons Butchers, Peebles, and Ben Wight of Midlock, Biggar. The young farmers prime sections will be judged by Guthrie Batchelor of Fleming Butchers, Angus. In the pedigree sections, an entry of 230 female sheep are forward. This comprises 102 Texel, 65 Suffolk, 30 Beltex, 16 Charollais, 11 Blue Texel, and six Berrichon. Judges include Rob Orr of Halbeath Farm, Dunfermline, for Texels; Iain Bissett of Mariain, Evanton, for Suffolks; and Gordon Carroll of Edendiack, Huntly, for Beltex. Lastly, pedigree cattle will be judged by Colin Smith of Towiemore, Keith. Male entries comprise seven Limouin, seven Charolais, nine Simmental, four Aberdeen-Angus and two Salers. There are also two Aberdeen-Angus females forward.